This window embodies the ideals of parental and Christian nurturing. In the lower portion, Jacob blesses his children. In the upper portion of the window, Christ gives His commission to Saint Peter. Henry Holiday (1839-1927) was an English historical genre and landscape painter, stained glass designer, illustrator, and sculptor. He is considered to be a member of the Pre-Raphaelite school of art, according to Wikipedia. In 1861, Holiday accepted the job of stained glass window designer for Powell's Glass Works. During his time there he fulfilled over 300 commissions, mostly for customers in the U.S. He left in 1891 to set up his own glass works in Hampstead, producing stained glass, mosaics, enamels and sacerdotal objects. Holiday's stained glass work can be found all over Britain and some of his best is at Westminster Abbey according to Wikipedia. 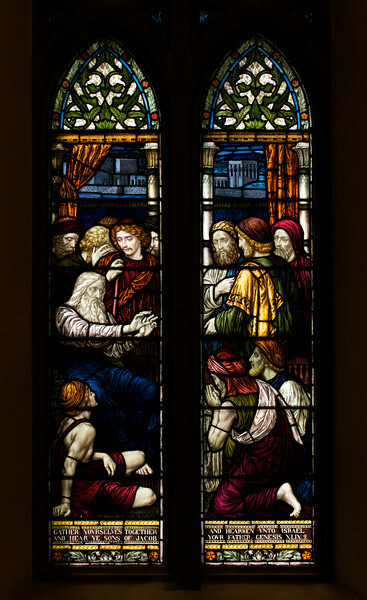 In addition to his stained glass work, Holiday was a painter; his works include The Burgess of Calais, The Rhine Maiders, Dante and Beatrice. He was commissioned by Lewis Carroll to illustrate The Hunting of the Snark. He remained friends with the author throughout his life.